A 'minimal' day turns into a very full day... and night. Obsession of the day: Nada. We all woke up in the manzanita forest behind the Andresons, and leisurely sat around the back table chatting. A couple of other PCTers (iPod and Bloodbank) had showed up overnight, and were ready to get to work prepping the place for the upcoming onslaught of hikers. 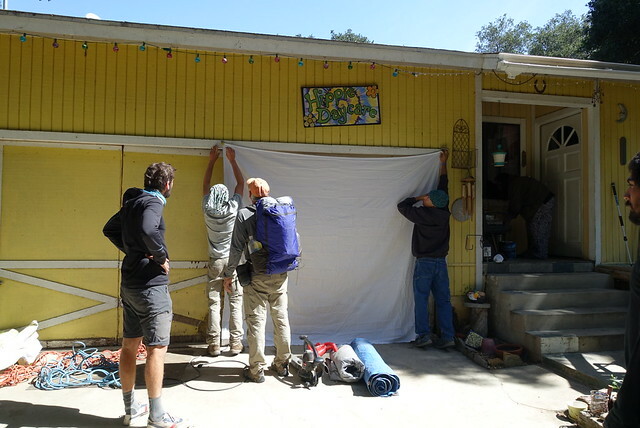 A few of us (me, Barista, Joko) were heading out though, and after signing our names on a pristine banner hung across the garage, Joe gave us a lift to Lake Hughes--thanks Joe, much appreciated. 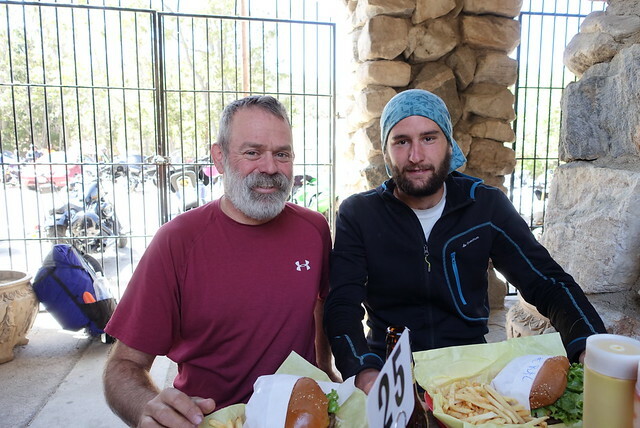 We stopped first at Papa's Country Store, a handy (and well stocked) store that was once a landmark on the PCT, before the trail was completed through the mountains just to the west. 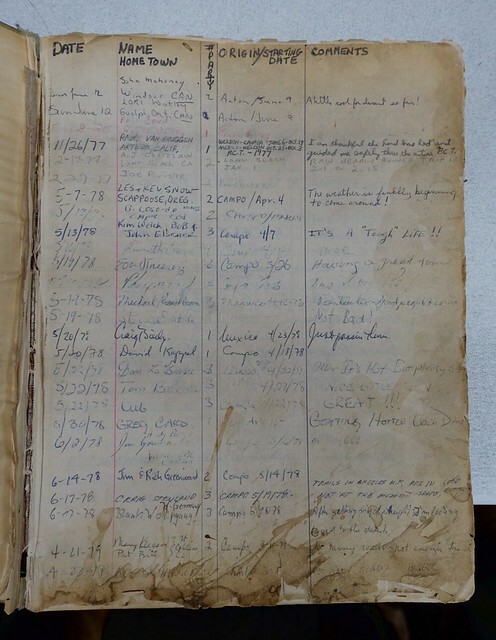 There's an old old old PCT registry there dating back to the late 1970s; of course I had to sign in. Hiker tip: it's pretty well stocked even down to the Knorr pasta sides that are one of my staple dinners now, I bought the Cheddar Chipotle bag which is one of my favorites. Across the street is the bigger landmark, though: the Rock Inn. It's been there forever, and I'd been there exactly once, sometime in the late 80s, just after getting my motorcycle. 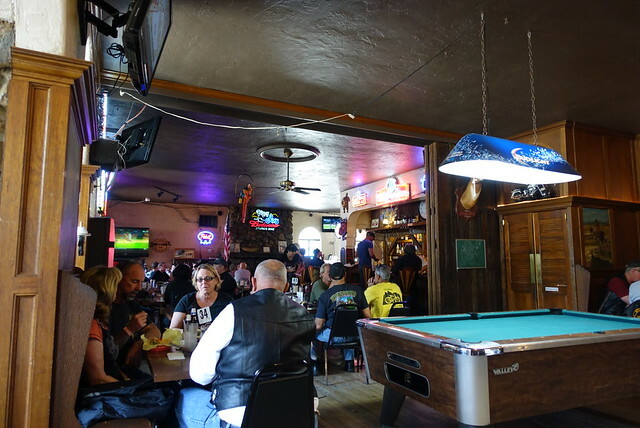 The Rock Inn is a fun place to hang out and have a burger and a beer (or an ice tea if you're a rider), and this being Saturday there was a charity poker run going on, so lots of bikers were coming and going. The three of us found a table on the breezy patio, and caught up with Marmot for a couple of hours. And... we couldn't hang there all day, sigh. I had wanted to get to Hikertown for the evening to stay the night. Again, I became happy with my decision to skip the PCT from mile 490 to 518; most water sources are dry except for a doubtful spring at the very beginning, and the report on that is a couple of months old now. At Hikertown I can catch up on... blogging or something, right? So to get to Hikertown means a road walk. The road from the Rock Inn to Hikertown is direct and kinda pretty after the burned area, but it's lightly travelled. Road walking is definitely not my favorite thing to do... but after three miles, a Mercedes pulled over and asked if we wanted a ride. Sure! The guy was out for a Saturday drive, and this still being kinda-LA he mentioned all the productions he's been in as an actor. "Remember Leo DiCaprio in J. Edgar??!? I'm the guy behind him in the courtroom scene! Oh, I'm in this Machine Gun Kelly video too, all over that one too!" It was cool of him to give us a ride; that would've been a long dozen-plus miles to walk. 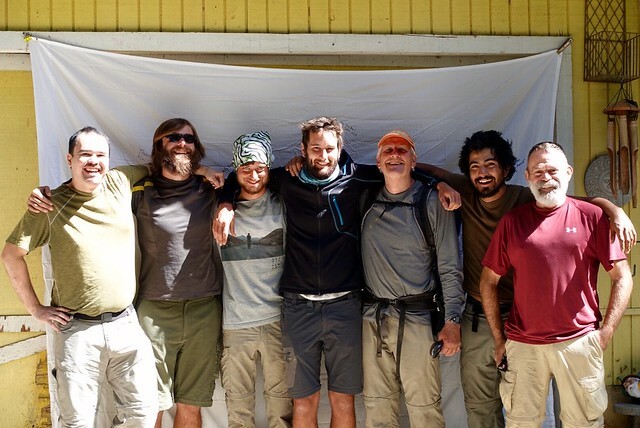 Hikertown was back to the PCT, at mile 518 and change. It was only 3pm, lots of light left in the day, and I didn't quite feel like waiting until tomorrow morning to get out and go. The other guys felt the same, so we filled up our water bottles in the Hikertown hiker lounge/garage, thanked the owner, and headed out. We started walking up the PCT on the official trail--and after 30 seconds on the official PCT, we said "screw this!" and went back to the road. The 'real' PCT was overgrown with dry grass and little tiny needles that got all up in your shoes and pierced our pant legs and made us itch like some mangy mutt. It was horrible--we'd be stopping for the next several miles getting rid of all those nasty invisble spines, there were so many after just walking a minute in the weeds. I thought I might be going just a bit crazy; I couldn't see almost all of the nasties but I could certainly feel them. 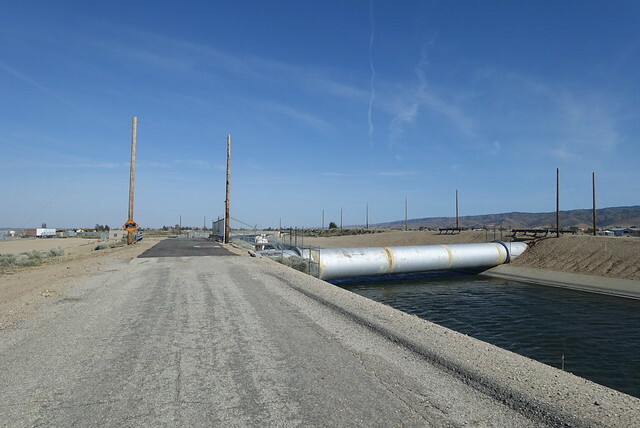 A mile north of Hikertown is the California aqueduct, and the trail turned 90 degrees right to head east alongside... then after another mile the trail turns north again, following the above-ground LA aqueduct along the east side. 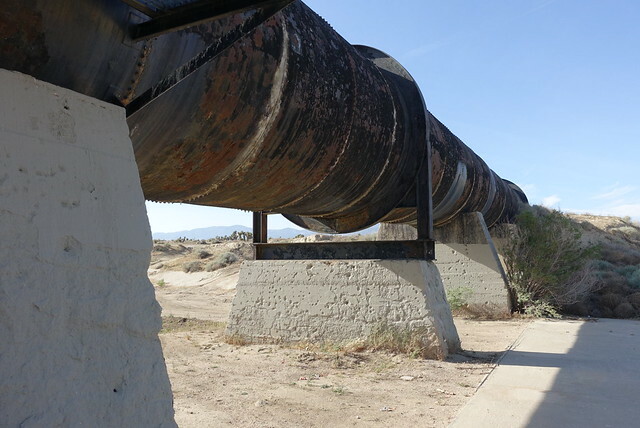 The aqueduct was encased in a very large iron pipe and looked steampunk. 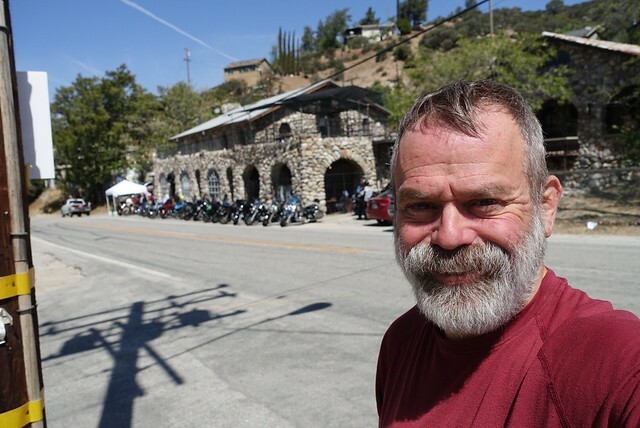 I wondered if that's still the original pipe from the Mulholland days, a century ago. 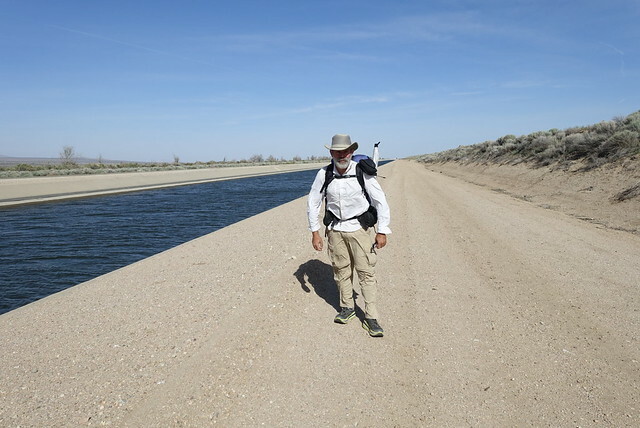 While you can't get at the water in the LA aqueduct, it did provide another benefit: it buffered the west wind, so those few miles hiking north weren't as tedious as they could have been. As the aqueduct turned east, the pipe turned into a buried channel, very new looking, with a smooth flat hard concrete top ten feet wide, which made for easy fast walking, particularly with the wind at our back. This was pretty much road walking, without the dangerous automobiles, and the three of us made really good time as we followed the gentle curves of the aqueduct for many many miles. Yep, we walked on water. 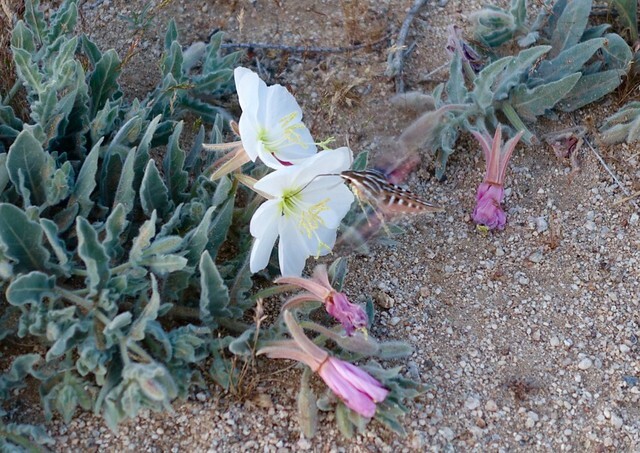 About ten miles out from Hikertown when dusk fell and the wind died down, the evening primroses on the side of aqueduct popped open, attracting dozens of sphinx moths, flitting back and forth across the aqueduct lid and the road next to it. It was a curious spectacle to watch, and I took a rest break with my camera hoping to get a decent picture of a moth feeding from the flower. Sphinx moths hover just like a hummingbird as they sip nectar; they must have super-fast metabolisms, then I realized I have no idea how insects 'work'. They're cold blooded, sure, but those moths were very energetically working those flower patches. Night came quickly, and it wasn't hard walking, with the wide gray concrete quite visible even on the moonless evening. 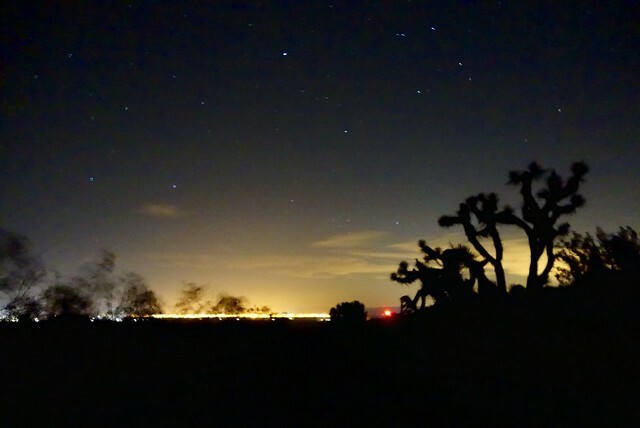 The lights of the cities down in the Antelope Valley reflected off the high clouds, adding a dim yellow glow you could almost see by as well. While the walking was easy, the miles were starting to wear on my, and I did start getting a bit of tunnel vision from my headlamp on dim. I really started wishing for a campsite, and started seeing ghost campsites right next to the trail that would disappear when I swivelled my headlamp over to look at them. It's past 9pm, it's past bedtime, and what's more is the wind had picked up. Earlier in the day Barista was kinda interested in pushing for Tylerhorse Canyon, I thought Cottonwood Creek bridge was more achievable, yet it's still five miles ahead. We plowed ahead, looking down at the GPS from time to time to figure out where we were; there haven't been many PCT markers since Hikertownwe'd and we might've missed one. The maps were useless, the desert mostly looks the same and the PCT itself is straight or gently curving. I found it's also much harder to estimate how far I've gone, I'd think I'd gone a mile but had only gone half the distance. 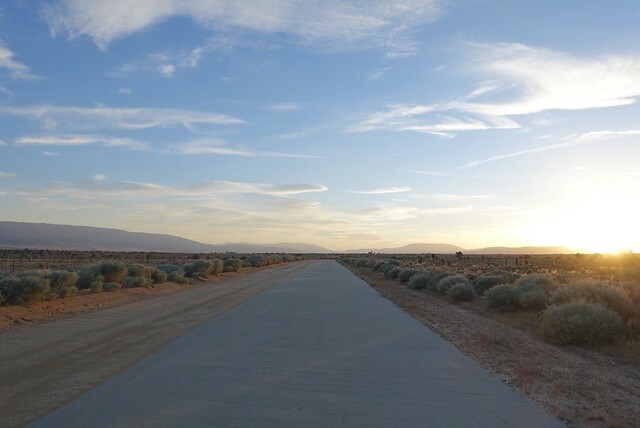 It was probably a combination of the wind and darkness and fatigue, but I kind of wanted to stop... especially after the PCT had left the smooth aqueduct, turned north along a dusty road, and went up a hill for some distance. I bet the hill wasn't steep, but in the 25mph headwind in the dark it sure felt steep. A couple of miles out we saw the red blinky lights of the wind farm, the trail rejoined the aqueduct and its smooth wide sidewalk lid, and I knew the Cottonwood Creek bridge was where we'd spend the night. We arrived just after 11:30pm. I was hoping for a sheltered gully or depression out of the wind, and when we arrived we scrambled around and found spots for our tents. I quickly put up my tent in the wind, underneath some emergency aqueduct release hatch, hoping that I wouldn't be flooded out, though I knew the aqueduct was dry. A gust picked up my tent as I was setting it up and dragged it over some old glass on the ground, slashing an inch long gash in the tent floor--grrrr, but that's what I brought duct tape for. At least I was out of the wind, at least it isn't cold (it didn't get below 58 degrees), and at least I'm not hiking in the dark anymore. Today was like two days rolled into one. I loved hanging out at the Andersons, I loved hiking in the daylight, but I don't think I'll willingly night hike again. 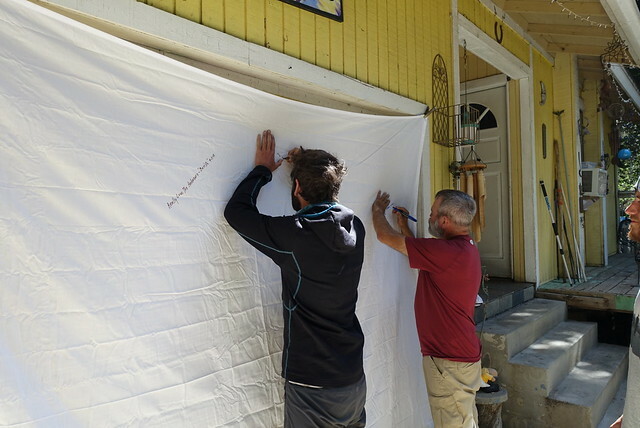 It's a chore and it makes the PCT feel like a tedious chore than an enjoyable experience. 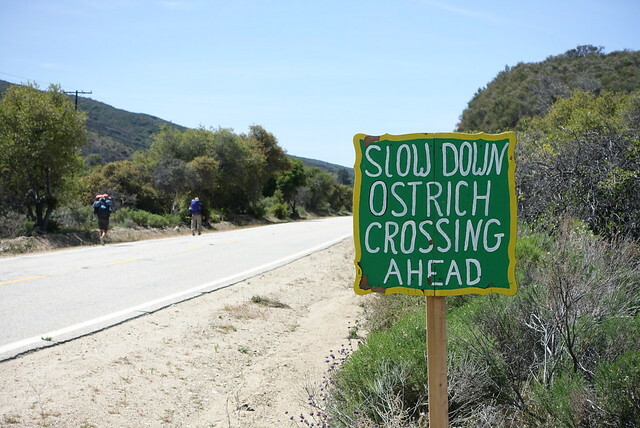 I'm really not on the PCT to tick off the miles as quick as I can, I'm really here to enjoy the scenery and wildlife and people I meet along the way. 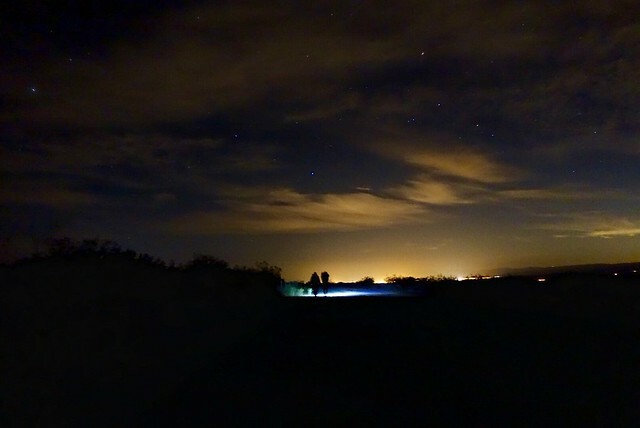 Hiking at night just makes me feel like I'm missing a lot of that. Now if there were just more people on the trail... :-) I'm just a bit early in doing all of this, which is fine, just a bit unexpected.